The relationships that Infants and young children have with their most important caregivers are the crucial context for healthy development as well as the development of psychopathology. The kind and quality of relationships that young children have with each of their caregivers can differ substantially. As such, these relationships are the centerpiece of assessment in infant and early childhood mental health. The Working Model of the Child Interview (WMCI), also called the narrative interview, is a clinical interview that assesses how a caregiver perceives, feels, and thinks about his or her child and their relationship. This interview is a well-researched and confirms that internal, subjective aspects of the relationship are critical to understand in order to assess relationship quality and the functioning of the dyad. This information can then be used to build on strengths and intervene with concerns, in order to optimize the relationship between the child and each of their parents or caregivers. In this training, the instructor will present a clinical case over time which will be used to illustrate the diverse ways in which different caregivers think about and understand the same child. This training will demonstrate the importance of understanding each caregiver’s perspectives of their child and themselves as parents towards impacting their child’s development, as well as current and future functioning. Intervening to impact caregiver-child relationships must include attention to this aspect of the relationship so that change can be sustained. Illustrative case and video vignettes will be presented. Register before June 1, 2019, and receive $99 early-bird pricing! Price increases to $115 after June 1, 2019. 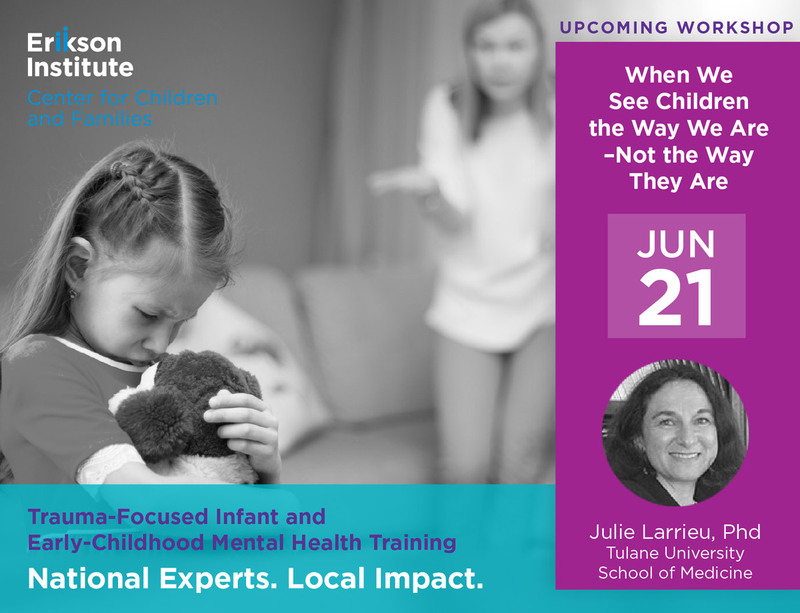 Julie Larrieu, Ph.D., is a Developmental and Clinical Psychologist and Professor of Psychiatry and Behavioral Sciences at Tulane University School of Medicine. She is a senior trainer at the Institute for Infant and Early Childhood Mental Health. She is also the Director for the Tulane site of the Early Trauma Treatment Network, a program within the National Child Traumatic Stress Network. This program, funded by the Substance Abuse and Mental Health Services Administration, is focused on disseminating child-parent psychotherapy for children ages birth to six who have experienced interpersonal violence and sudden loss. Dr. Larrieu’s ongoing research interests include developmental psychopathology, child abuse and neglect, and symptoms arising from early trauma. She has over 25 years of experience working with high-risk infants and families. Understand the importance of caregivers’ perceptions of the child (i.e. the state of mind regarding parents’ relationships with their child and how it impacts their functioning). Recognize common themes that can be demonstrated by a narrative interview. Use information based on this interview to identify goals for intervention with caregivers and children.